Life Sized 36" Alpaca Figure from 100% Alpaca Wool | Sun Valley Alpaca Co. If a real alpaca just isn't in your immediate future, try the next best thing. You'll love him from the tips of his ears to his cute fluffy tail, and all parts in-between. 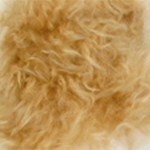 "Al" is sure to bring a smile to everyone’s face with his or her all-natural friendly fur. Built on a sturdy wire-frame, makes it ideal for imaginative play and it's cuddly appearance will have everyone ooh-ing and ahh-ing. A wonderful gift, our adorable alpaca will transform a child’s nursery or bedroom into a place of imagination and wonder. Each of our alpaca “friends” are made from 100% real alpaca fur - completely unique; no two are ever the same. Each has its own look, natural color, and fur structure. Alpaca fur is friendly, a natural by-product of alpaca farming. No animals are ever harmed to use their wool. From the handmade craftsmanship to the quality of the child-safe eyes, attention to every detail makes this a truly amazing product. 100% Alpaca Fur / wool underbelly and inner leg. This is a life sized "cria" alpaca - Crias are young alpacas under 18 months old. Available in Fawn (as shown) for immediate Ground only shipping. Figure ships bent, please straighten legs and adjust ears upon receipt. Once upright repeated bending/unbending can damage shape. Please keep in an upright pose. I love this alpaca. I am saving my money....kinds format, but seems well worth it.